This is the DMT diamond mini hone set. The set contains a Blue: 325 grit stone, a Red 600 Grit stone and a Green: 1200 Grit stone. It is perfect for your tool box or workshop. The mini hone will sharpen knives, carbide bits, scissors, saw blades, engraving tools, ceramic, glass, crystal and drills! Click Here for Meat Grinders & Butcher Supplies! This is the DMT diamond mini hone. It is perfect for your tool box or workshop. The 2.5 in. Red 600 Grit mini hone will sharpen knives, carbide bits, scissors, saw blades, engraving tools, ceramic, glass, crystal and drills! 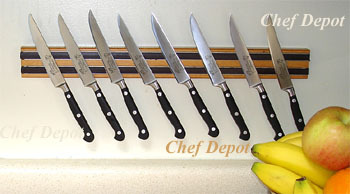 Chef Notes: It is perfect for sharpening anything. The Mono crystalline diamonds will not break apart during use. These diamond sharpeners outlast all the competition! The red 600 grit is our favorite for most sharpening jobs. Other grits are also available if you call us. Our Duo Sharp Plus Bench Stone is 8" Double Sided, two-grit, (8" x 2 5/8" x 3/8") and comes with a non-skid mat and optional Duo Base. The black base (12.2" x 4.6" x 2.2") can be used with either size Duo Sharp plus stone and provides 2" knuckle clearance for ease of use. The "Plus Feature" is a continuous long strip of solid diamond surface idea for scissors and chisels. Rubber feet secure the base and stone to your workbench. The base also features a convenient handle on the underside for moving the stone over a large work piece and a unique feature that provides maximum versatility! A non skid mat is also included. These are perfect for woodworking, knives, chisels, scissors, carbide router bits and more! The surface is covered with the highest quality mono-crystalline diamonds (superior grade). The stones are made to last for thousands of uses and are interchangeable and replaceable. This diamond System will quickly produce a razor edge on any good knife or carbide bit with six to ten strokes! This is a 4 inch diamond sharpening stone. It measures 4 x 7/8 by 3/16 inches. Perfect for the tackle box or tool box! This stone will sharpen anything, quickly puts a razors edge on knives and tools! This stone is covered with a continuous monocrystalline diamond surface. It is perfectly flat and will stay that way. Other grits are also available if you call us. Chefs Note: This little stone is perfect for the tackle box, tool box or workbench! 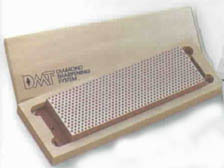 This is the DMT folding knife diamond sharpening stone! It is 9 1/2 inch long when opened. This stone is encrusted with monocrystalline diamonds and will quickly return the edge to any knife with a few strokes. Butterfly style handle folds around the diamond shaft for easy storage! It is perfectly flat and will stay that way. This stone is ideal for the toolbox and tacklebox! Choose from 4 grits below! 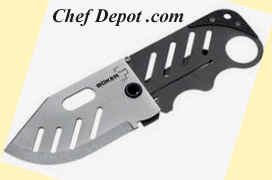 This is a new Kasumi Titanium Utility Knife, with a 4 3/4 in. blade, it's the sharpest and slickest blade made. The edge that it holds is hair splitting and remains throughout heavy use. 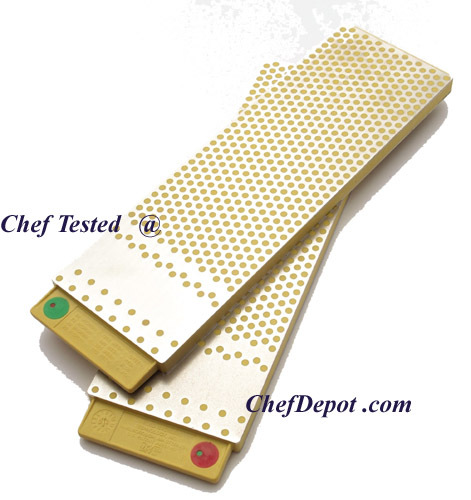 The non slip ergo poly handle is very comfortable and virtually indestructible, perfect for every serious Chef. We could not believe how sharp these knives were until we tried each one. It simply glides through most any food! The outstanding Kasumi Titanium coated blade has been achieved by combining the best of advanced modern manufacturing. Keeps a sharper edge longer than other knives. Chefs Note: Slicker than oil on water! Possibly our favorite knife. Comfortable, lightweight and perfectly balanced. Each knife is carefully finished by the hands of skilled craftsmen. You will love this knife! Mfr. Limited Lifetime Warranty. Click here for more Kasumi knives! Free Shipping in Cont. USA! This is a perfectly flat diamond sharpening stone. It measures 8 in. x 2 1/2 in. and is over 3/8 in. thick. It weighs enough to not move during use but it also includes non skid rubber feet! This stone will sharpen anything, quickly puts a razors edge on knives and tools! This stone is covered with a continuous monocrystalline diamond surface. 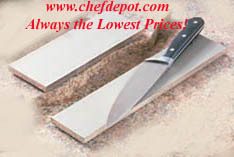 Click Here for German Knife Sets! 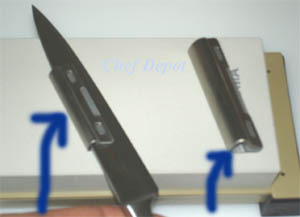 Chefs Note: These little clips are plastic lined stainless steel and they will help you sharpen. Chef is easily sharpening a quality knife! This is a diamond sharpening stone in a beautiful solid redwood case! 8 x 3 inch stone can be used dry or with water. This stone is excellent for knives, chisels and scissors. It has non skid rubber feet so it will not move during use. This stone will sharpen anything, quickly puts a razors edge on knives and tools! This stone is covered with a continuous monocrystalline diamond surface. Chefs Note: A perfect guy gift! Every man would love to have one of these stones! It is perfectly flat and will stay that way. We love the wood case, lasts for decades!